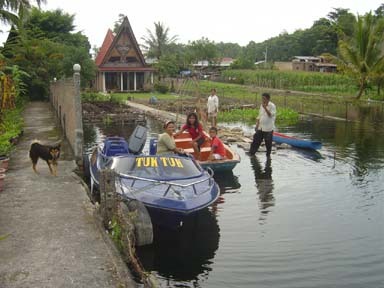 Horas Family Home is a self contained traditional Batak house right on the lake for families or groups. Catering for between 1 and 6 people it is located between Tabo Cottages and Bagus Bay Homestay. There is excellent swimming right in front of the house and hot and cold water showers. There are 2 double beds in the upstairs bedroom and 2 single beds in the downstairs bedroom and a self contained kitchen. Have you stayed at Horas Family Home?